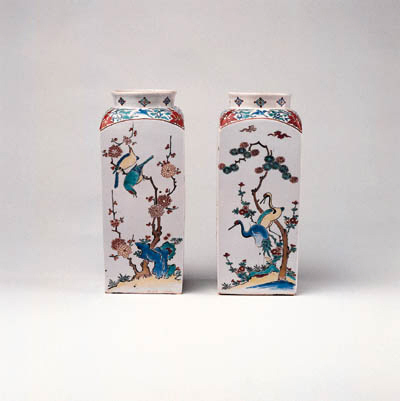 Similar vases without covers are illustrated in Friedrich Reichel Altjapanisches Porzellan aus Arita in der Dresdener Porzellansammlung, no. 80, Soame Jenyns Japanese Porcelain, pl. 56b, and another in Kakiemon no Sekai, Genryu kara Gendai made, no. 41. A similar pair of vases with covers and ormolu mounts from the Prince de Condé collection in the Musée du Louvres is illustrated in Porcelain for Palaces, The Fashion for Japan in Europe (1650-1750), (British Museum, 6 July-4 November 1990), no. 149, which mentions two other pairs in the State Rooms at Windsor Castle and in the Collection of Her Majesty the Queen at Buckingham Palace. A pair from Hampton Court is illustrated in M. Hinton, O. Impey, Kakiemon, Flowers of Fire, no. 19. which mentions that these vases, of a shape derived from Dutch glass, share with the vases of the form known as "Hampton Court vases" the use of a brown enamel unknown elsewhere in Kakiemon style enamels.